The AO Spencer No. 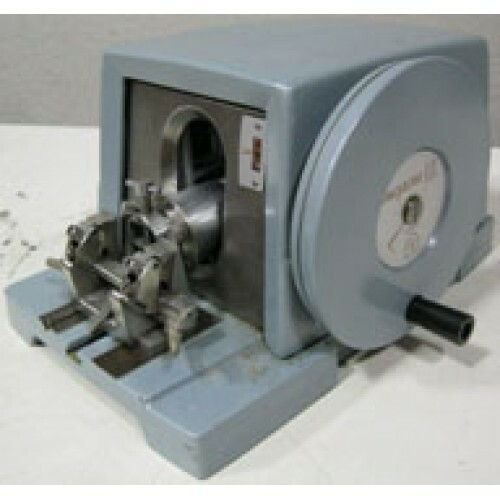 820 Precision Rotary Microtome has long been the standard sectioning instrument in virtually every medical, educational and research laboratory in the world . . . . wherever materials must be critically sectioned for examination with the microscope. For over half a century, the “820”, as it is familiarly called, has remained unchallenged for precision, dependability and over all superiority of performance. The “820’ is better than ever! Significant improvements in styling and construction provide new and important convenience features. You’ll find it easier to use, easier to clean, easier to lubricate, and . . . more precise than ever! The operating principle and time-proved mechanism remain essentially unchanged. However, new manufacturing methods and new inspection controls have resulted in still closer-than-ever assembly tolerances, for the vital fittings of the three hand-lapped, compound slide-ways. New, more easily accessible lubrication points have been provided to assure longer life. The all-important feed mechanism remains unchanged . . . is independent of the vertical movement of the object block. With every complete revolution of the counterbalanced drive wheel, the feed pawl engages precisely into the teeth of the ratchet wheel, feeding on the forward stroke and disengaging until the next stroke. The ratchet wheel rotates a feed screw which advances the cone a measured distance from left to right across the face of a vertically moving inclined plane. This reduces the ratio of feed and drives the object block forward toward the knife in such precise increments that tissue can he sectioned down to 1 micron in thickness. Compound slide-ways provide smooch, accurate object travel. The up and down excursion of the object block is two inches . . . permits cutting of large serial sections. The feed indicator, graduated in microns, is conveniently located on the front of the “820”. A knurled knob at the back of the microtome controls feed settings from 1 to 50 microns. A detent action assures positive adjustments in 1 micron increments. A slight forward push of your thumb against a lever locks the counterbalanced drive wheel securely. The object block is stopped at the top of its excursion . . . you have ample clearance to safely insert and orient specimen block, clean knife edge, or remove knife without disturbing knife holder alignment. A quick flip of the lever releases the wheel.